We’re a Japanese Drumming Group located in Albuquerque, NM available for performance, demos and classes. Available for performance, demonstrations and classes for all levels. 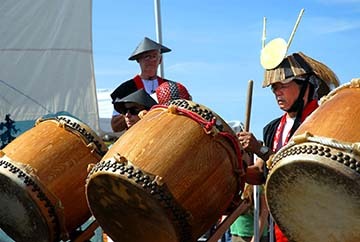 New Mexico Taiko group can accommodate all types of venues and is even available for out-of-town performances. Educational programs and demonstrations are available for audiences of all ages. An excellent choice for school-aged children. Taiko drums for New Mexico Taiko are hand-made by the Head Sensei. Japanese style Bells and Drums are available for sale. There is no mistaking when New Mexico Taiko begins to play, the resonant tones of the drums working together can quickly fill any performance space and command the immediate attention of anyone in the vicinity. 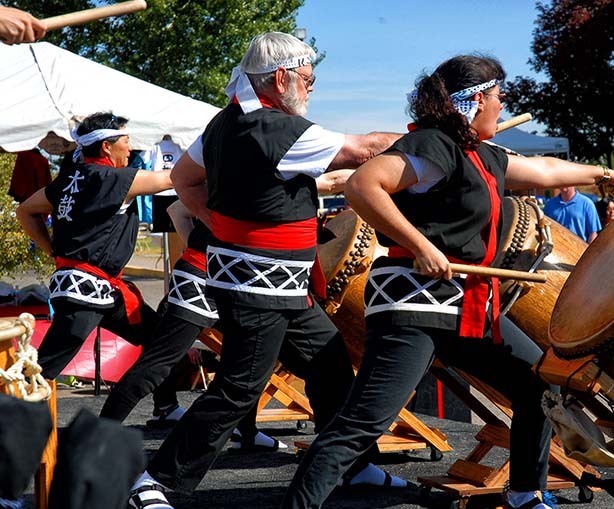 New Mexico Taiko group performs in all types of venues such as festivals, parades, community celebrations, banquets, educational programs and any event that wants to experience the rich cultural heritage of Japanese drumming. 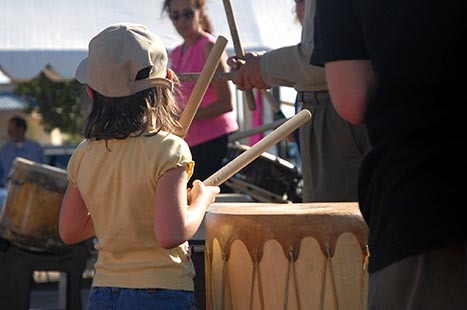 All ages are invited to learn the basic skills of taiko, including taiko history, terminology, and drum information. Students will learn Kuchi Shoka, Kihon, and Kata. This group is for those who have completed the beginning class and have proven to be proficient in taiko basics. Increase drumming skills while learning new songs, techniques and informal improvisational drumming. 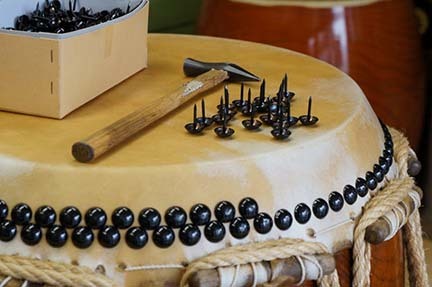 This group is for those who do not want to perform, but would rather just drum. The performance group requires an informal audition and is for the serious taiko player. This class is for the player who shows proficiency in all areas of a taiko performance. This group requires a lot more dedication and practice. The art of Taiko is a blend of martial arts choreography and synchronized drumming. Taiko simply means " great drum" in Japanese and now taiko has taken on the universal meaning of an art form. 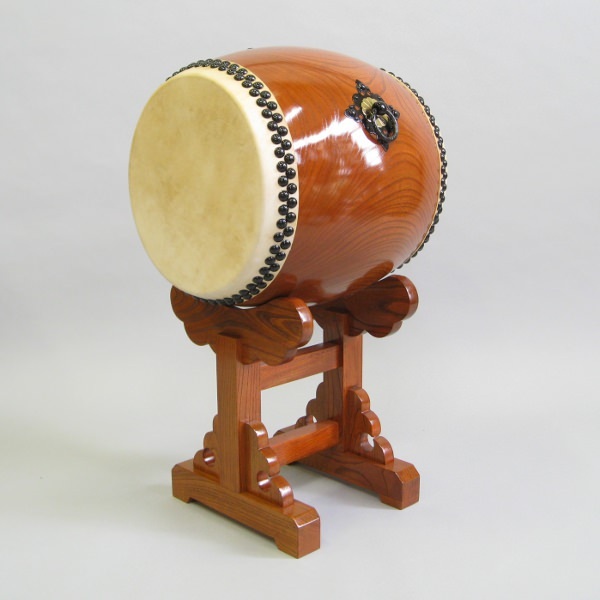 With origins in ancient Japanese tradition, taiko drumming dates back approximately 2,000 years. It was used in battle, in religious ceremonies, in theater settings, at community festivals, and even for insect control. Modern displays of taiko are mostly limited to celebratory performance.